I cannot believe that I almost forgot to write about Kitchen Arts and Letters! This place is like the Holy Grail to all chefs, home cooks, and anybody who loves food. 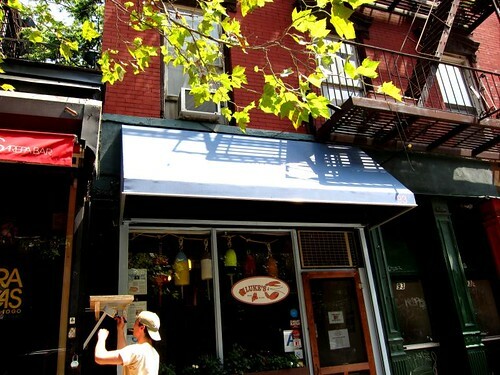 Owned by Nach Waxman, this tiny bookstore houses everything and anything about food. The moment I stepped, I could feel my heart skip a beat and I couldn’t breathe. 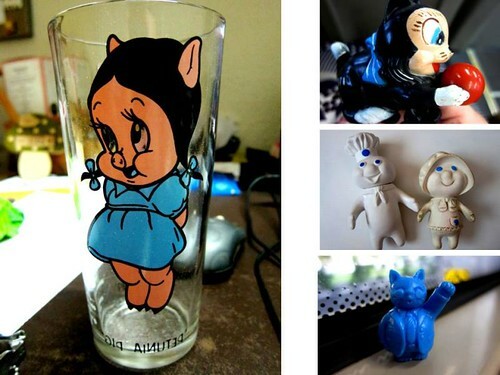 I was only at the door, I felt dizzy, giggling like mad – Kitchen Arts and Letters was my haven. However do not be deceived by the size, Kitchen Arts and Letters have some of the best (food) collections I have ever seen. 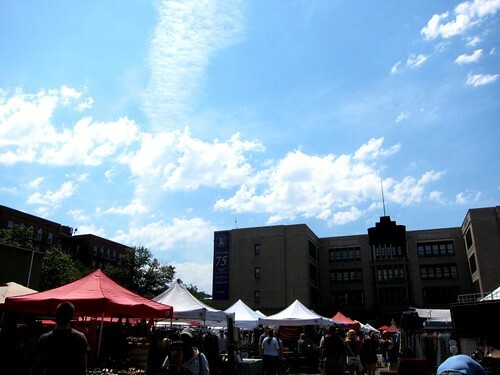 When I was there, I couldn’t resist and flip through pages of the Modernist Cuisine (it was so beautiful). Despite only spending less than an hour in the shop, I managed to control and bag four books. One of them is Marjorie Winslow’s Mud Pies and Other Recipes. This may sound like a bake book but no – it is a cookbook for dolls. It has recipes for Grilled Mud Sandwiches, Sawdust Cake and so on. Reading this book was a delight and this was one book that I would have never discovered on my own. 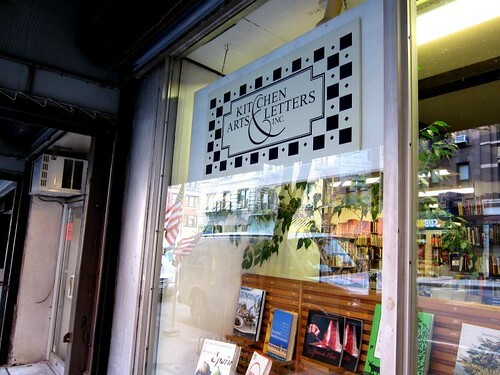 If you are a fan of cookbooks or food, do drop by Kitchen Arts and Letters. People there are friendly and helpful – when I told them I worried about my luggage space, they promptly informed me they provide shipping. Gosh they are so “evil”! 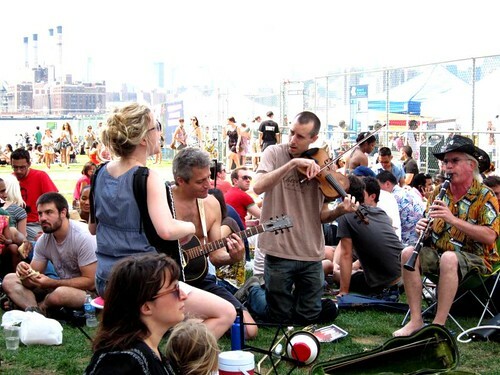 The last couple of days in New York, the weather got ridiculously hot – it was hotter than Singapore! Kat and I got really tired and lazy, and actually dread going out for fear of the heat. Kat did some research and found a Moroccan restaurant near our apartment which we went for dinner. 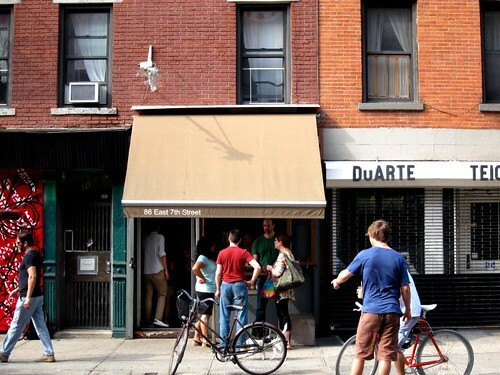 Located at St Marks Place and a mere 10 minute walk from our apartment, Cafe Mogador was packed. We had to wait outside for 15 minutes (and no way we would dine al fresco). The waiter was kind and brought us glasses of iced water to cool us from the heat. Once we were seated, we realised the place was not just packed, it was loaded with noise. I think because it has a low ceiling, the noise somehow compact into the restaurant. As it was Kat’s first time having Moroccan food, I took the liberty to order for us. 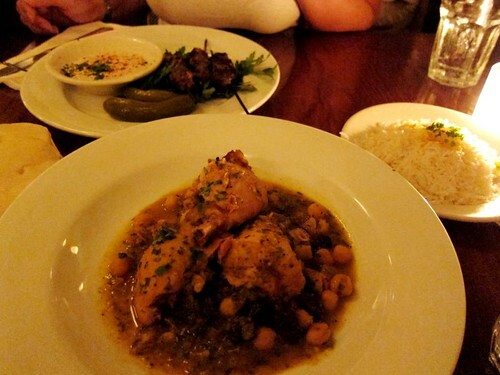 Since we did not have much appetite, I settled on a lamb Kefta Kabob and a (Casablanca) Chicken Tagine. The lamb Kefta Kabob was smaller than expected but Cafe Mogador served them with a side of hummus which was delicious. I have not much to say about the kabob as I am not a fan of lamb and I cannot get pass the gamey taste. For the chicken tagine, I ordered the accompanying Casablanca sauce which comprised of chickpeas, raisins and onions. I love the sauce – its part sweet part savoury. The chicken was perfectly cooked, and with the sauce and basmati rice, it was wonderful. 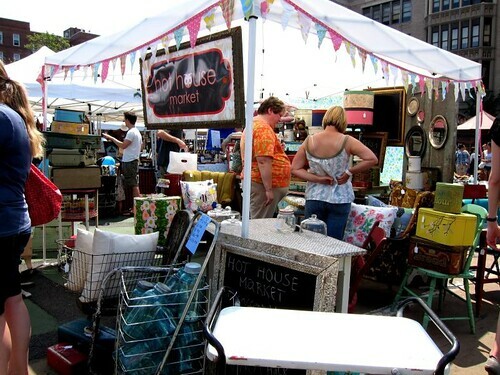 Despite the heat, I was pretty happy that we managed to find this treasure trove on our last days in New York! Every night, when Kat and I went back to our apartment, we would see people gathered around at the shop next door. One night, curiosity got hold of me and I decided to take a peek. And guess what? Its an ice cream shop! Lula’s Sweet Apothecary is an all vegan ice cream parlour offering sundaes, sodas, sweets – the place is decorated to remind you of old school soda shop (even the staff was dressed to the part). 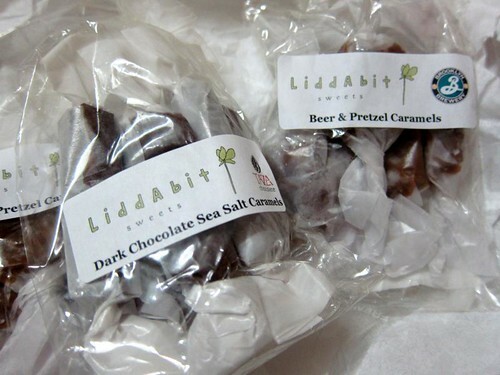 Lula has conventional flavours like chocolate, vanilla and strawberry. 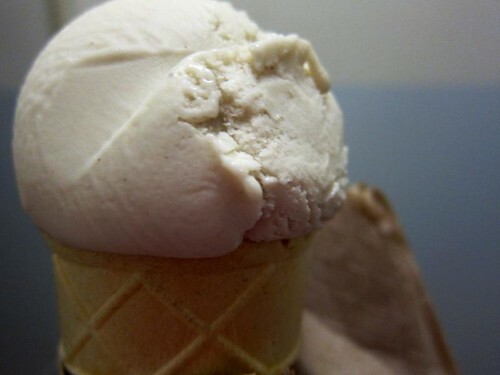 On the night I was there, I decided to be adventurous and go for the root beer ice cream which tasted like … root beer but it was not as sweet as the drink. It was actually strangely nice. Slurp! As I walked to the train station in the morning, I would see bikers, office workers crowding around this tiny coffee shop. Since I needed a java jab, I sneaked in and took a look. Abraco is this small espresso bar that smelled delicious, not just from the coffee but from their amazing looking breakfast items. They have brioche, croissants, and muffins. If not, I was meeting a friend for breakfast, I will definitely bag one for the road. 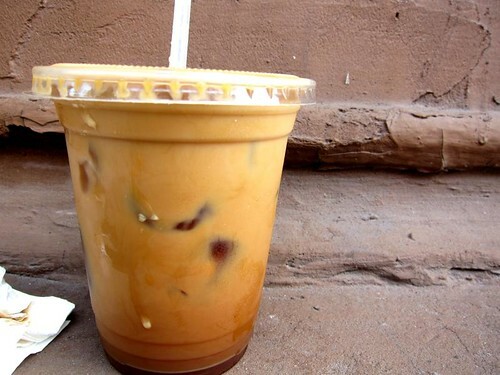 In the end, I ordered the simple iced coffee which was rich and bitter – the way I like my coffee. Sip! 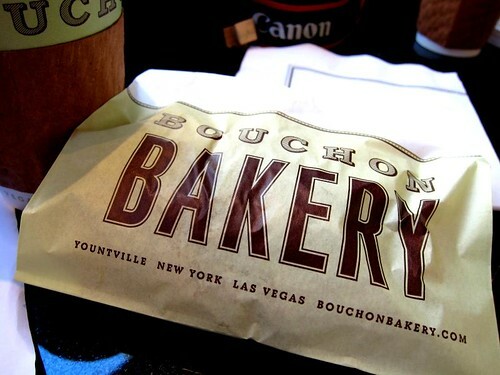 The place for breakfast was Bouchon Bakery. Opened earlier this year, Bouchon Bakery took over the space from the iconic Dean and Deluca, serving breakfast treats, desserts and pastries. And yes Bouchon is the brainchild of Thomas Keller. For breakfast, I ordered the classic ham and cheese croissant. 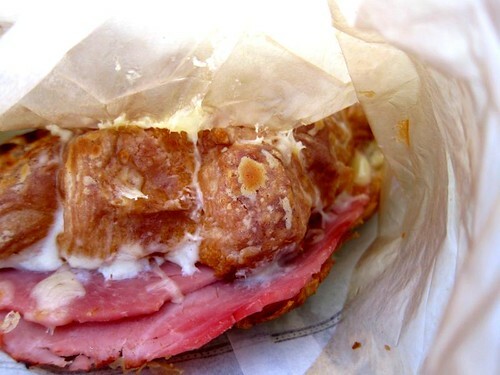 I wished they have toasted the croissant a bit more – the sandwich was bordering between lukewarm and cold (from the ham and cheese). I like my sandwich to be warm and toasty. Bouchon has this amazing desserts display case, showcasing all the sweet treats. 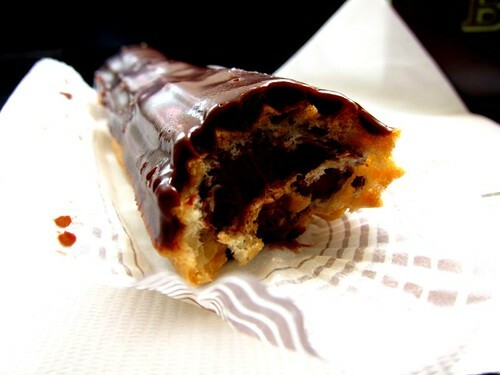 And I cannot resist and order a chocolate éclair. 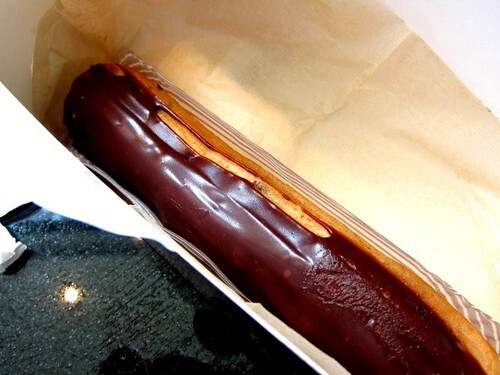 I love the chocolate éclair – crunchy chocolate ganache on top, filled with a generous amount of chocolate cream. Sweet! 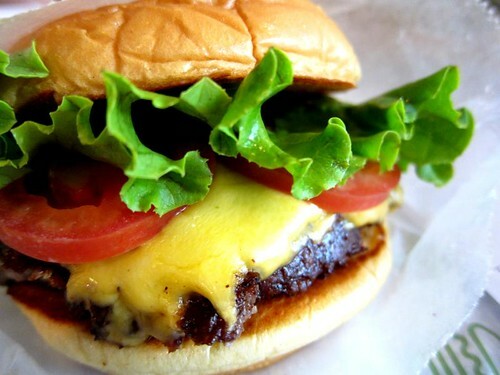 If there was only one burger place you had to go in New York City, I would recommend Shake Shack. 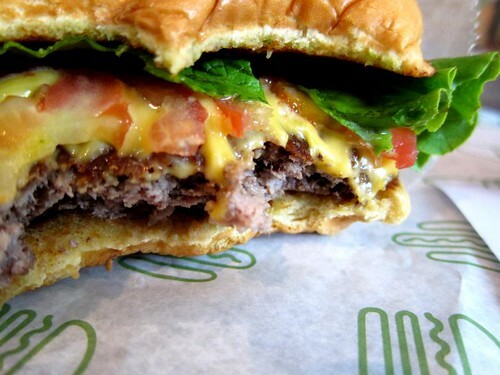 Shake Shack, the brain child of restaurateur Danny Meyer, is a restaurant chain selling affordable grubs such as burgers, hotdogs, milkshakes, frozen custard and so on. 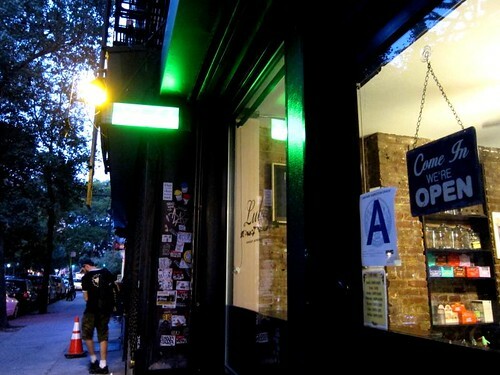 The first outlet is located at the Madison Square Park and still commend long queue during lunch hours. And its not just the Madison Square Park outlet, it seems the rest of the outlets have pretty long lunch queues too. To ensure that I do not get myself stuck in the queue, I chose the Upper East Side outlet (Lexington Avenue) and ate at 1130am. I ordered the simple single cheeseburger, and a cup of Arnold Palmer. For the cheeseburger, I chose to have it with lettuce and tomato (I omitted the onion and pickle). The first bite was heaven. The beef patty was cooked to medium, hence it was warm and juicy. The burger bun was pretty good too – freshly baked and soft. 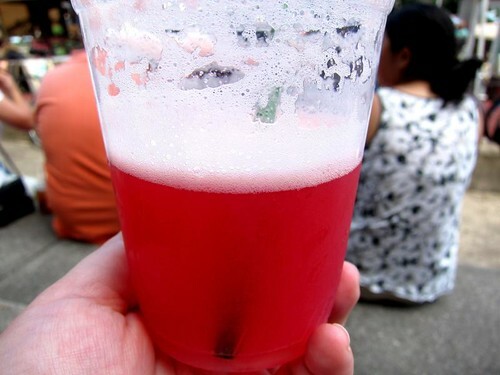 If Arnold Palmer (US$2.15)was on the drinks menu, I would almost always order one. 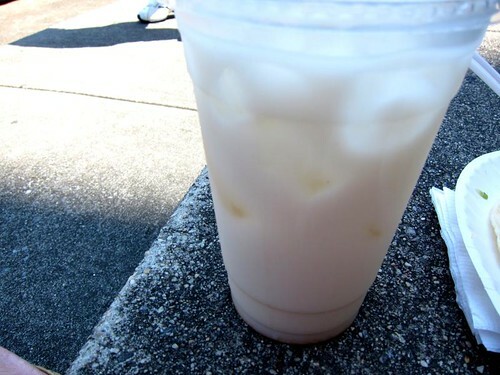 Half lemonade and half iced tea, its a must have in summer. As it was still super hot in New York, I didn’t have the stomach for fries or their famous frozen custard. I was also very impressed with the service at Shake Shack. The staff was very friendly. They asked me about the food and even helped me to clear my tray. 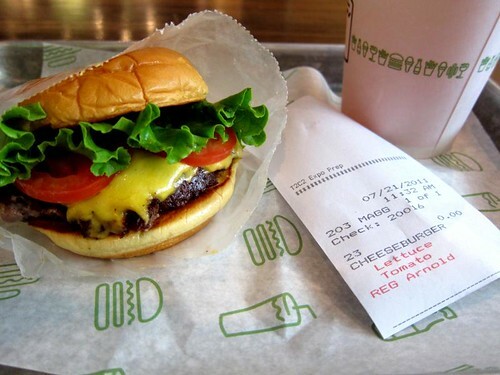 There is almost nothing not to love about Shake Shack – great prices, multiple outlets (read: convenience). NOW I want a burger from there! Shake Shack has outlets around New York City so do check out their website for details. 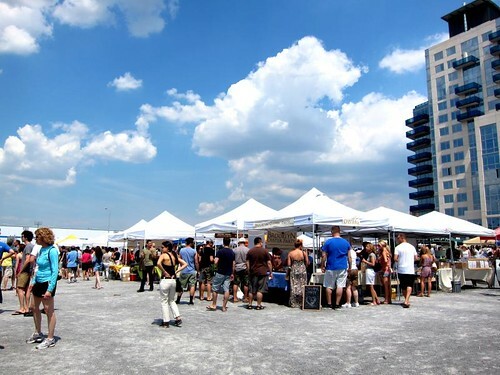 They also ventured outside of NYC – Washington DC, Miami, and even Dubai. 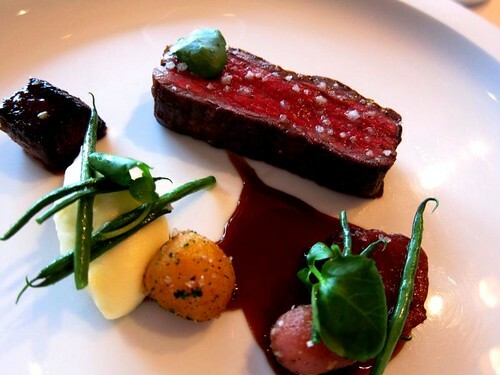 When I was planning my trip to New York, I know there was that one restaurant that I want to try – Per Se. Months before the trip, I was reading Grant Achatz’s Life, On the Line. 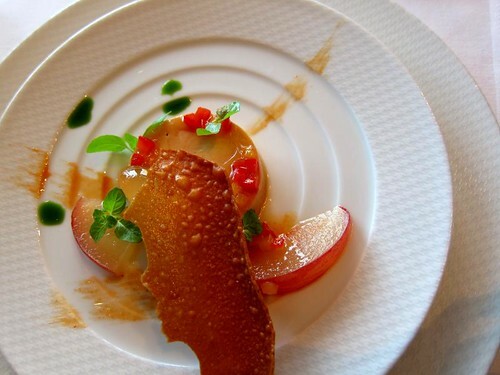 In the book, Achatz illustrated the time he spent at the French Laundry, and the way he described Thomas Keller (owner of the French Laundry and Per Se) made me really curious about Keller and his food. 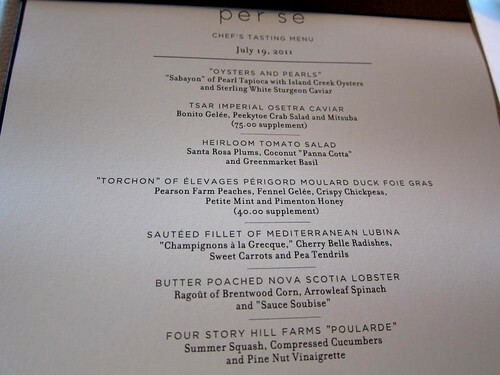 So precisely a month before the date we wanted to dine at Per Se, I tried to book a table via Open Table which was IMPOSSIBLE – there was never an opening. So I decided to go traditional and call up the restaurant. After a 15 minutes wait, I got a table on 19 July and 545pm (I was offered a table at 9pm but I think I will just fall asleep while eating). 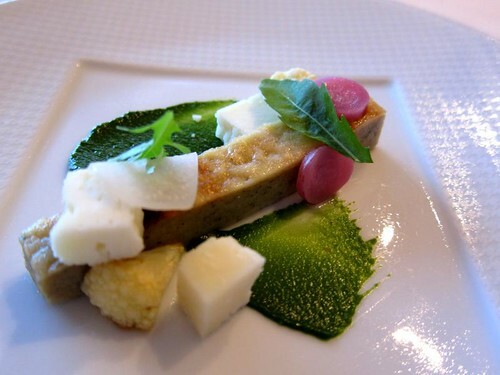 Per Se – three Michelin stars –US$295 for the tasting menu – I have high expectations. I was prepared to be blown away. My heart was pounding when I reached the Warner Time Center. But first we needed to find the restaurant. The moment we reached the 4th floor of the building, Kat and I walked one round and we couldn’t find the restaurant. 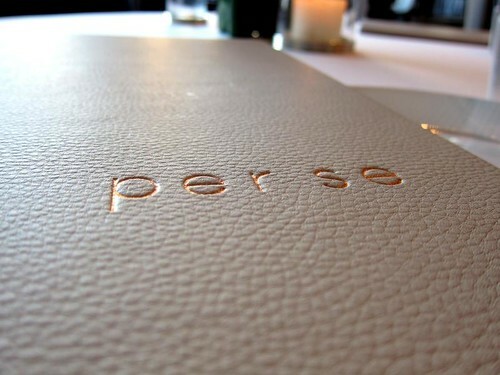 Thanks to its minimalist decor, we finally discovered that Per Se was behind the blue door that we walked past. We got ourselves seated in the main dining room facing the Columbus statue and were shown the menu and were asked to make the selection. Once that was done, complimentary amuse-bouche was served to us. 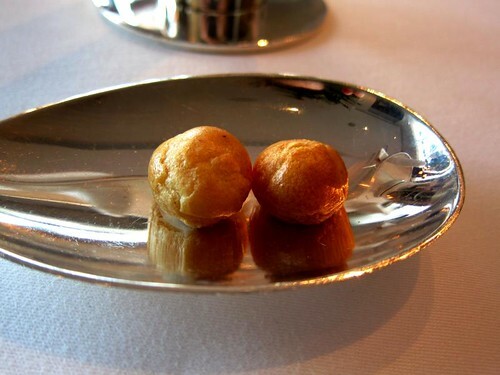 The first was gougeres – cute, warm and cheesy – which we easily finish off with one bite. 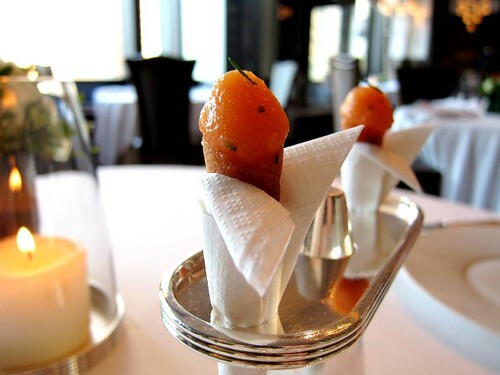 The next was the famous salmon tartare cornets – this whimsical amuse bouche was served on a cone stand, and we bit off like an ice cream. I love the freshness of the tartare but I thought the “cone” was alright. 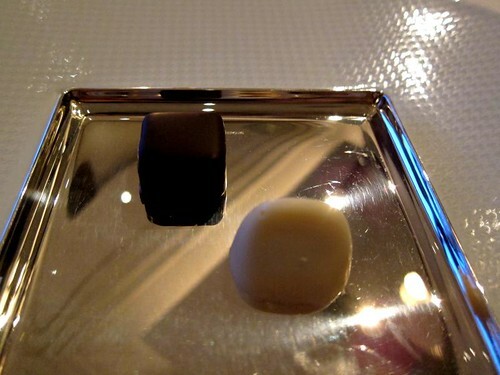 Once the amuse bouche was cleared, our tasting menu began. First, Oysters and Pearls. 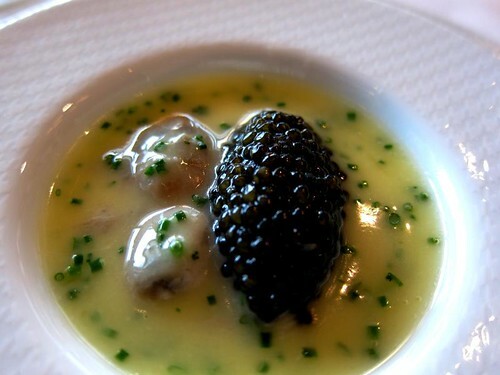 This dish essentially was a sabayon of pearl tapioca with oysters and caviar. This was my favourite dish of the night – the pearl tapioca was delicious and not overcooked. The oysters and caviar (pearls) tasted like the ocean – refreshing, and salty. 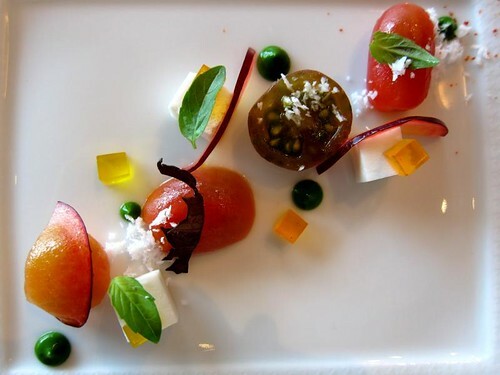 For the second dish, I have chosen Heirloom Tomato Salad. This was my first time trying heirloom tomatoes. For me, the taste of the tomatoes was like a cross between a plum and a tomato – they were sweet and juicy. As Kat was not a fan of the vegetable, she chose Foie Gras which was served with a side of brioche and a selection of salt. I did not have a taste of the foie gras (not a fan of the liver) but Kat did tell me that they were a bit salty (hence she did not need the salt given). 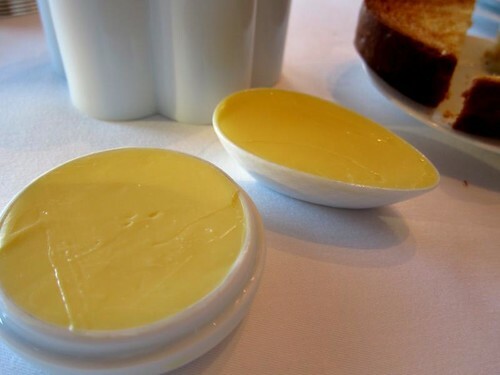 For the brioche, I think once they have left it at your table for five minutes, the waiter would swing by and replace with another plate of warm brioche – which we thought was a bit excessive and wasteful. Once we were done, we were presented with the bread basket. Kat didn’t get any and I saw a pretzel roll and I couldn’t resist it. I was sad – the roll was cold and chewy. 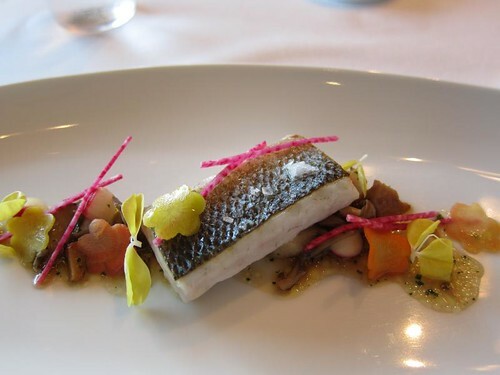 Next was the fish course – Sautéed Fillet of Mediterranean Lubina. The fish was simple and perfectly cooked, and flaky. What I love was also the presentation of the dish – adored the little vegetable flower cut out. 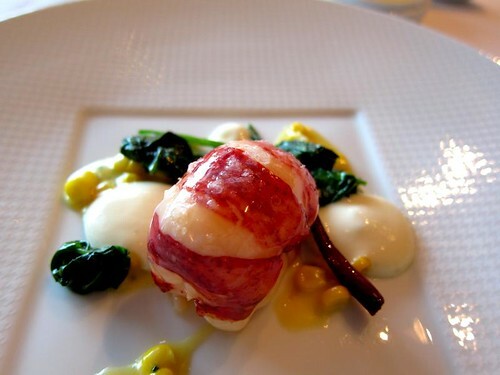 The next dish we had was Butter Poached Nova Scotia Lobster. I was unsure is it because of the size of the lobster meat – I found it to be a bit too much and slightly overcooked. However I enjoyed the accompanying ragout of Brentwood corn – it was sweet and delicious. For the poultry course, we got Hill’s Farm Poularde. The chicken was tender and well seasoned. As I think they have stuffed the leg with (possible) bacon or pork (which I can taste it), I couldn’t finish the chicken. At this stage, we were struggling – our tummies were feeling the strain. And we got another meat course – Calotte de Boeuf. For me, it was perfectly cooked – medium rare (I must see blood! 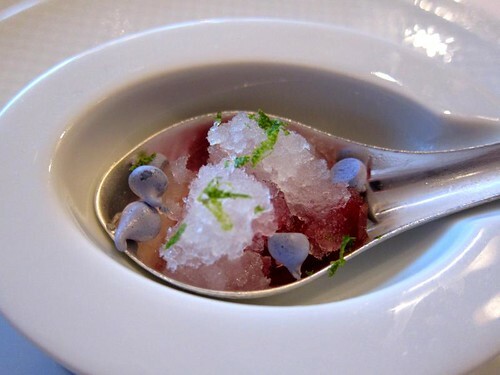 ), salt crusted; and the jus was flavourful and light. For the vegetable course, we got a Roncal which was a medley of (mashed) vegetable. I don’t remember much of this dish as I didn’t really like it and I thought was the weakest among the lot we had. I believed I left the plate half eaten. At this point, our waiter suspected that we were too full to stuff ourselves with any more food – he brought us a complimentary “palate cleanser” – it was some sort of flavoured sorbet with lavender meringue and sake. 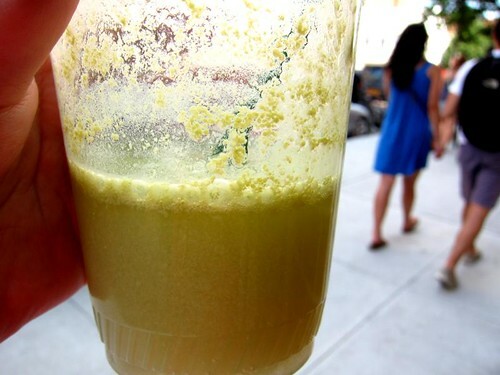 This was a life saver – it was light and refreshing – something that was much needed. After the palate cleanser, desserts were served. 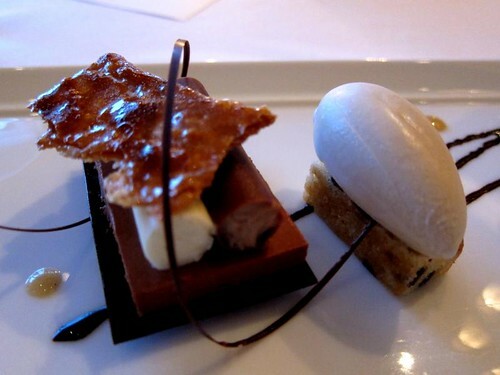 Desserts at Per Se were never ending. They just kept giving us more! The first of the many desserts was the coconut and melon sorbet. The flavours were subtle and it was a nice and light start to the dessert course. Next, we got the Maple Sour Mash which was a caramelised puff pastry topped with bourbon-maple syrup ice cream. 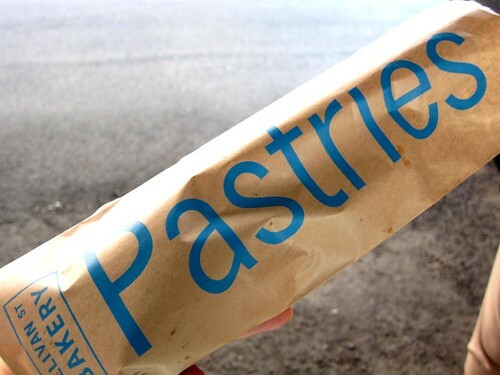 The pastry was buttery and crisp, and for the ice cream – the flavour was once again subtle and not overpowering. At this point, I was expecting them to serve us their famous Coffee and Donuts. But NO. Perhaps they thought we were full and didn’t serve it to us? Why? I maybe stuffed but I am greedy! 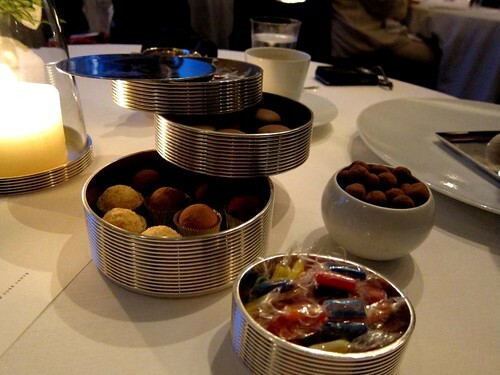 Still Per Se managed to overwhelm us with chocolates, truffles, pulled-candy, macarons. They will stuff you to death! At the end of the meal, Kat and I got a pack of sandwich cookies which sadly did not make it into my stomach. They were crushed to bits on the way home to Singapore. 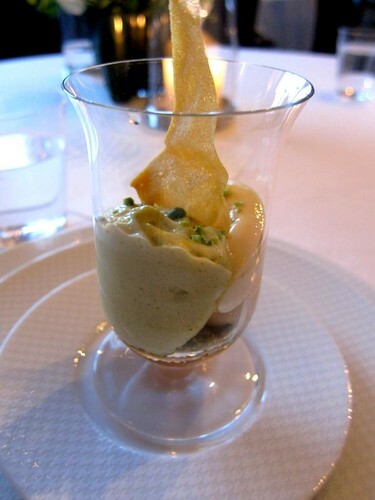 For me, the service at Per Se is a reflection of Thomas Keller – organised, (sterile), consistent and swift. 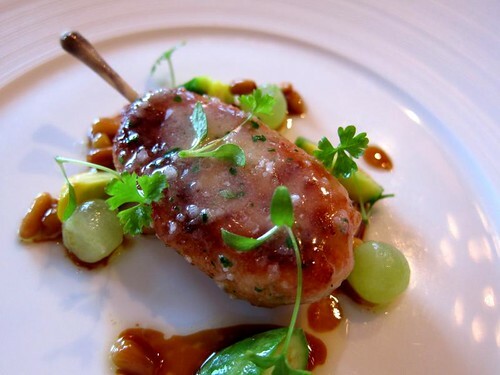 I am not totally blown away by Per Se – I just feel there was always something missing. Still, it was a great experience which I am proud to have. One of the places that I have heard so much for their reasonably priced pastas, pizza and anti-pasti was Otto. Owned by celebrity chef Mario Batali (Iron Chef!) and his business partner, Joe Bastianich (Masterchef USA), Otto served up comforting and delicious cuisine. 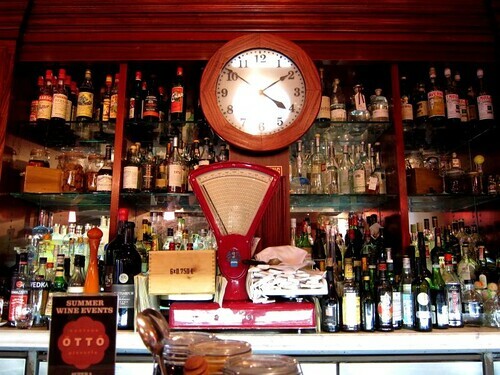 Otto – Love the clock! 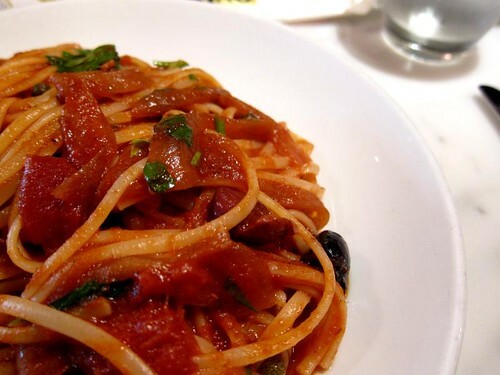 For lunch, I chose my favourite – Linguine Puttanesca. This Southern Italian pasta is simple and savoury, combining anchovies, capers and tomato sauce. Three ingredients. That’s all. Otto’s version was flavourful and not overly salty. The portion was huge too – I only managed to finish half the plate. 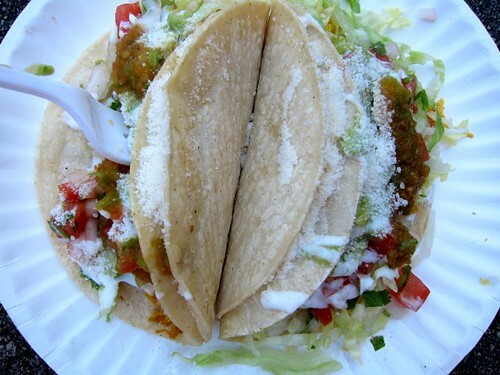 I liked Otto for its take on food – simple yet delicious. The place itself had an old school charm too. 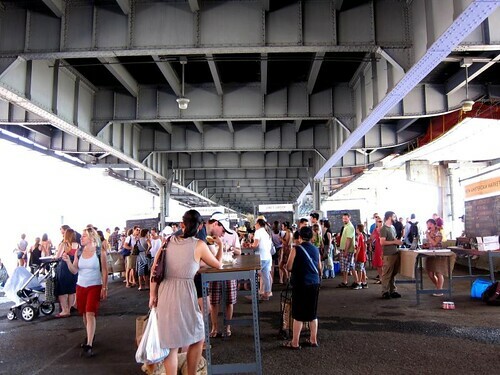 After our encounter with Luke’s Lobster at New Amsterdam Market, Kat was still missing the lobster’s roll. A couple of days later, we made our way to Luke’s for brunch. At 11am to be precise. 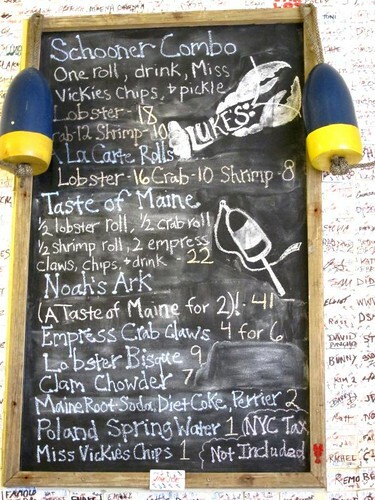 The moment you stepped into Luke’s Lobster, you are kind of transported to the coastal village, Maine. 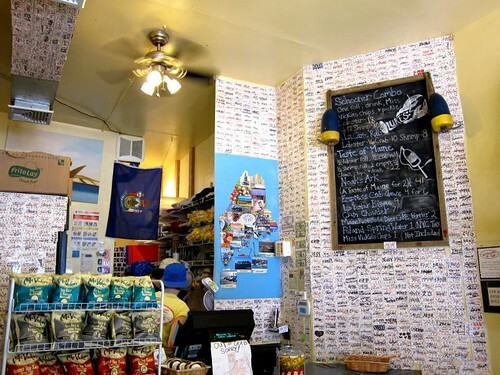 Nautical icons such as nets, ropes, knots, buoys were used to decorate the shop, mimicking a lobster shack. As we were there pretty early, the lobster bisque was not ready. However luck was on our side, while we were ordering our lobster rolls, the waitress informed us that the bisque was done. Though it was a pretty hot day, the bisque provided great comfort to our exhausted souls (we were in Boston the day before and were thoroughly tired from the train ride). The bisque was rich and had a very strong seafood flavour. 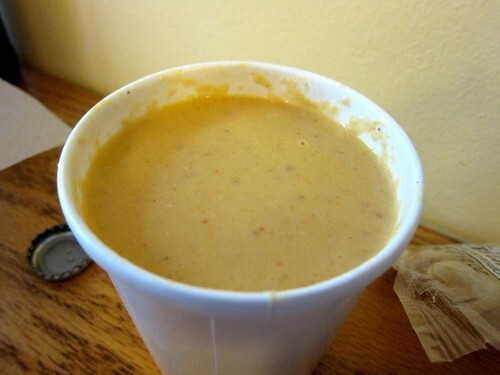 And Luke’s was not stingy on the lobster – chunks of lobster meats can be found in the bisque. 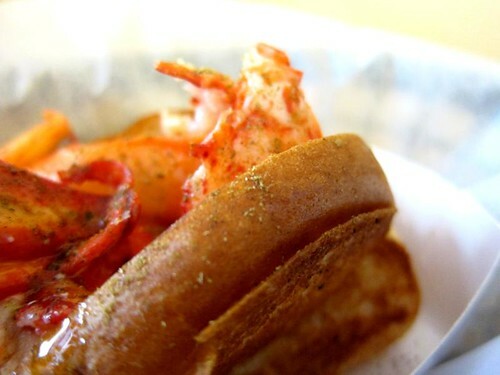 The star of the day was definitely the lobster rolls. 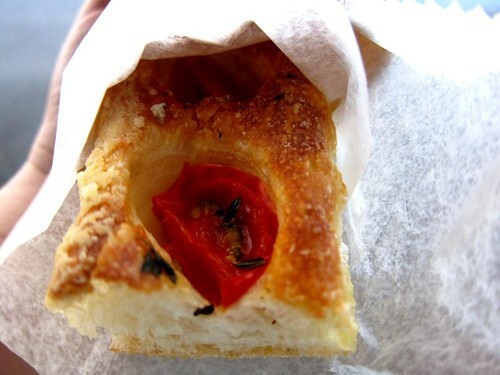 Let’s start with the roll – soft, buttery and toasted to perfection – the bread was simply delicious. As for the lobster, they were chunky, plump and meaty. It might seem a bit expensive (US$16) for a lobster roll but the freshness and the amount of meat inside the roll were just incredible. 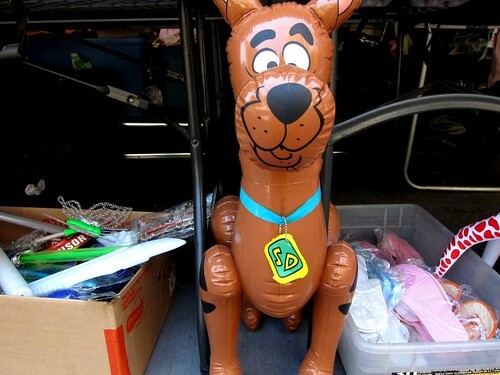 It’s worth every penny. 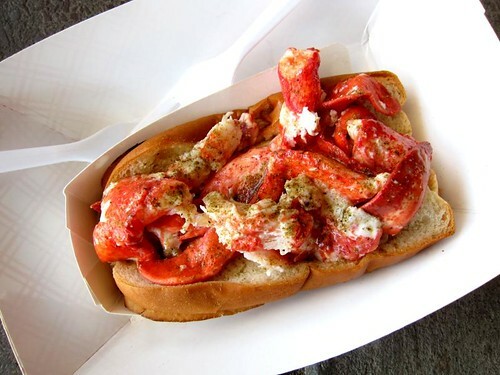 I am glad we do not have Luke’s Lobster in Singapore; if not, my cholesterol level will be sky-high. I cannot remember exactly how it happened. But after a few direct messages (Twitter) and a couple of emails, I met Robyn aka The Girl who Ate Everything. I have been reading her blog and writings (via Serious Eats) for a couple of years. She is hilarious and animated. And her doodles are pretty incredible too. Robyn gave me a few food options. All of them sounded delicious but I decided to go for Motorino Pizza – I think it will be wrong to come to NYC and not have a slice of pie. And it was the best decision I ever made – Motorino produced these gorgeous artisan pizza from its wood burning oven, and till now, they are best pizza I ever have. 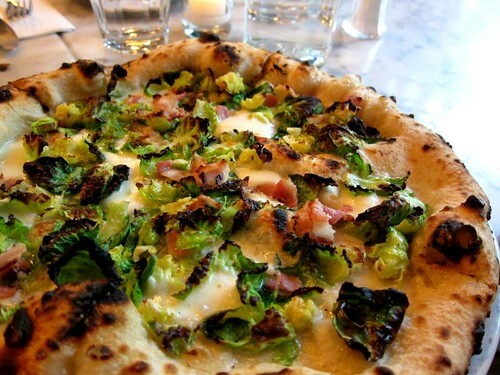 Since Robyn was the only one who been to Motorino (Robyn’s friend, Francine also joined us for dinner), she suggested that we should try the cherry stone clams, and brussels sprouts and pancetta pizza. Thanks to the high temperature of the wood burning oven, the pizza were delivered to our table pretty fast. 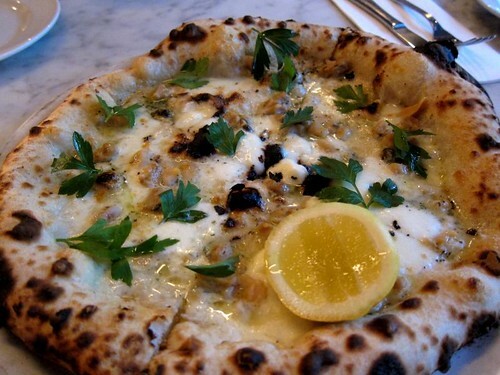 The cherry stone clams pizza was delicious – it’s like a piece of heaven. 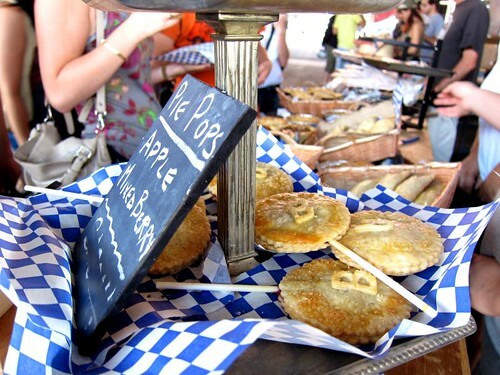 With a tiny squeeze of lemon on top of the pie, the clams were sweet and melt in your mouth. The pizza and the mozzarella were soft and chewy. And the crust. The oh-so-wonderful crust. It’s a good crust. I was not exactly looking forward to the brussels sprouts and pancetta pizza as it was a combination of the two things that I don’t like. I detest brussels sprouts as they always leave a bitter after note. As for the pancetta, it’s pork. And miracle happened. I was in love with this pizza. For the first time, brussels sprouts tasted so good – they were actually sweet and earthy. There was no bitterness. For the pancetta, well, it’s savoury and porky. Without letting Robyn and Francine know, I secretly picked the pancetta and hide them under my crust. At the end of my NY trip, though Motorino Pizza was the only pizza place I went; it will be the pizza place that I will always lust (A little shout out to Robyn for bringing me to Motorino and sharing a slice with me). PS. 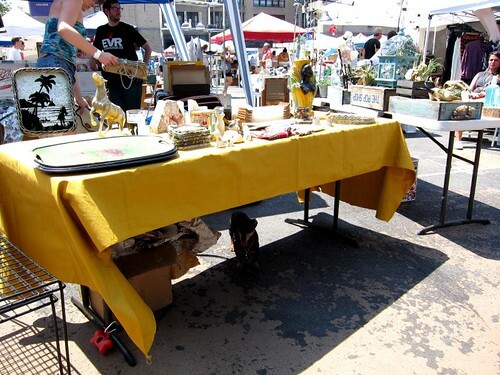 Robyn did a great write up on Motorino too!